1BR The Springs Condo, Keystone`s River Run Village, Walk to Gondola, Amzing Kids/Family Vacation! Welcome to one of Keystones� foremost vacation destinations, The Springs! Walking in to The Springs spacious lobby you�ll instantly understand its� popularity. This gorgeous building features every amenity you could think of, including; a recreation room featuring a home theater and pool table, a kids� play-room, an upbeat workout facility, a top of the line steam room, a large outdoor fire-pit, ski and bike storage, and one of Keystones� best outdoor heated pools! The beautiful rock-motif is a great setting for the well thought out pool area. Your kids will love the kiddie pool and water slide, while you enjoy the multiple hot tubs and grilling patio. Perfectly placed in River Run, The Springs is both secluded and within walking distance from the slopes! All of these amazing features are sure to put The Springs at the top of your list when planning your next family getaway. If you have discerning taste, then this stunning 1 bedroom, 1 bathroom condo (plus additional sofa bed) is for you! The only platinum level condo in The Springs, 8852 has lots of upgrades and a polished mountain-chic d�cor! Enjoy the slab granite, top-of-the-line stainless steel appliance kitchen with a large walk in pantry. Sit down at the bar height bistro table and chairs on the patio, as you sip your morning cappuccino with the hummingbirds. 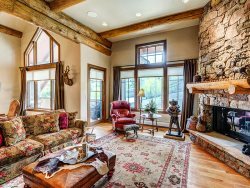 Step inside to a luxurious living room with accent color walls, vintage ski art and antique skis. Relax in the leather loveseat around the cozy gas fireplace or enjoy the serene views of Wolf Rock right out your window! Perfect for a couples getaway, or small family, you�re sure to love this elegant condo!